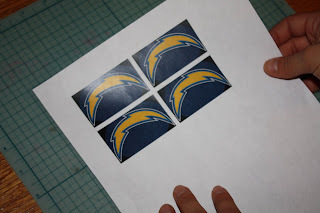 The above little beauty is the team logo for the San Diego Chargers or who we San Diegans affectionately know as the Bolts. Due to a couple of football party cupcake orders I have for this weekend, I'm going to be needing a few of these cut out of fondant. Instead of manually cutting them one by one, I thought it would be a good idea to use a cookie cutter. 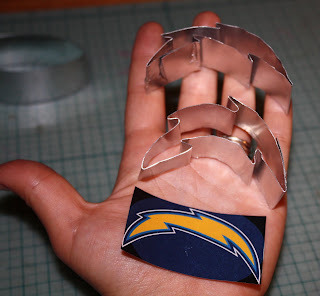 One problem: Where was I going to get a Charger Bolt cookie cutter in the size I needed? 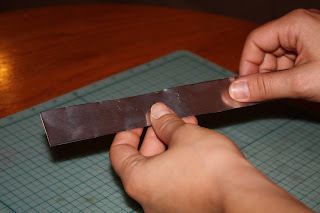 One of the 1" strips. 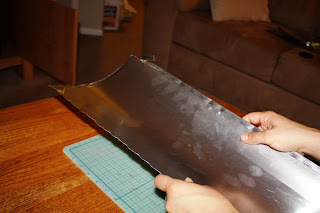 The templates/guides I used for the cookie cutters. 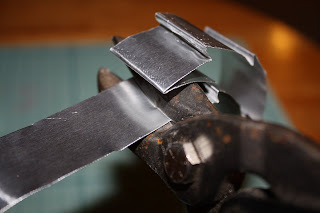 I began by folding/bending the strip of metal around the shape of the bolt. I used my thumbs to work out as many of the wrinkles in the edges as I could. Of course, ECA couldn't let me have all the fun. He had a go at it, too. Once you're done shaping your cookie cutter, you might be left with a tail. 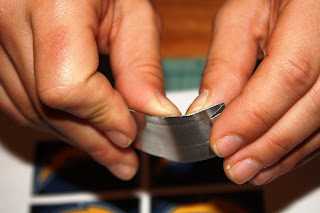 Use the tin snips to cut it off but leave a little bit at the end to fold over and glue. 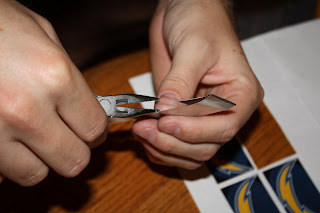 Wrap the extra bit over the raw edge and use a bit of hot glue from a glue gun to seal. Ta-da! The finished products. ECA's is on the top and mine is on the bottom. It's OK, you can say his is better. It'd probably just serve to stroke his male ego. 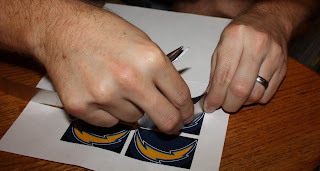 Oh fine I admit mine looks more like Sonic the Hedgehog than a Charger Bolt but COME ON, it was my first try!! 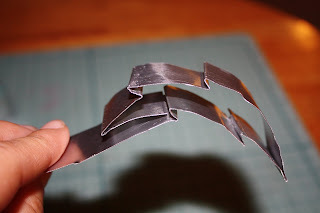 I'd love to see some cookie cutters that you made! If you get a chance, post a pic! Very cool - I never would of thought of that! 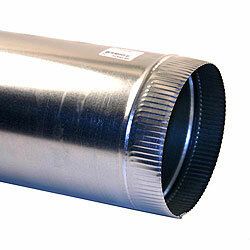 THAT WAS SO COOL I would have cutr my hand to pieces working with that tin.. Cool idea! Stopping by from SITS to say hi and check out your tutorial! Oh wow Nicole, these are amazing. I am making my list of all the cookie cutters you can make for me...LOL!! So, I went to Walmart and a few other stores to find the pots for the DIY cupcake stand, and had no luck. I am thinking because its getting colder, but I did luck out and find some cute white cupcake holders at Walmart for only $5.00. Your confidence was well founded after all! Those came out great. Now that you know you can do custom cookie cutters it really opens up a lot of possibilities for creative fondant cutting. How wonderful! I love cookie cutters. The ones you made are really great! Stopping by from SITS. I will definitely be following this blog! Awesome idea here. 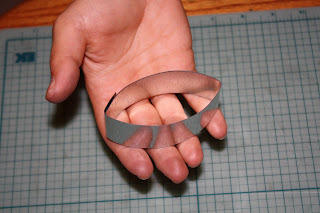 I make a lot of rolled out sugar cookies and it isn't always easy to find the cookie cutter I am looking for. I am excited to try this. Thanks for sharing! Wow! You are fearless!!! 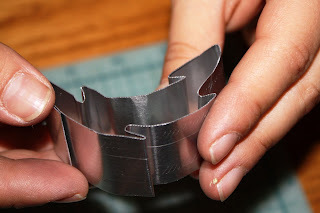 Never would have occured to me to make my own cookie cutter! I'll be feturing this post on my Sunday weekly links post. so great! You are so creative and ingenius! I would have sat down and pouted. Ooo! That's an awesome idea! I can't wait until I have some free time to bake some cookies with a custom cutter! So clever! Im glad I stumbled upon your blog. Im a new follower now! Great Blog! Oh, wow! You made your own cookie cutters? Now that's impressive. Great job! 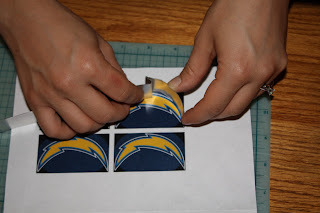 I saw the fondant pieces you cut out with them on the charger cupcakes.